The Lentek MK12 Guardian Mosquito Trap is based largely on the technology of the original Lentek MK01 model, but the Lentek MK12 Guardian mosquito trap is packed with new features. The Lentek MK12 features a convenient push-button ignition start, advanced thermal imaging, lighter weight, and wheels that make it much easier to move around. 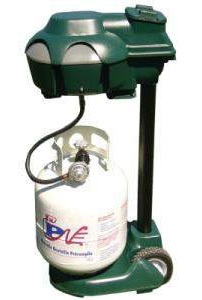 The Lentek MK12 Guardian Mosquito Trap uses propane to generate CO2 which functions as the primary long-range mosquito attractant. Octenol, moisture, and warmth (thermal imaging), serve as effective secondary attractants to lure, capture and kill mosquitoes and other blood-seeking flying insects. For more information on the Lentek MK12 Mosquito Trap, CLICK HERE. The Lentek MK14 is very similar to the MK12, but even more portable, as no electrical or extension cords are required! The Lentek MK14 cordless mosquito trap is powered by a patented internal power generation mechanism that uses propane fuel to operate the fan and LEDs. Thus, the MK14 is restricted by the need for an external electric power source. At last, a cordless propane mosquito trap. The Lentek MK14 Guardian Mosquito Trap also uses the propane to generate CO2 which functions as the primary long-range mosquito attractant. Octenol, moisture, and warmth (thermal imaging), serve as effective secondary attractants to lure, capture and kill mosquitoes and other blood-seeking flying insects. For more information on the Lentek MK14 Mosquito Trap, CLICK HERE. From its irritating whine to the sting and itch of its bite, the mosquito is at the bottom of human kind's list of favorite creatures. These tiny insects, once nothing more than a summer annoyance are now capturing headlines worldwide as new information emerges about the diseases they carry, their numbers, and there growing resistance to insecticides. Of all the harmful creatures on Earth, the 3,450 species in the cullcid, or mosquito family pose the greatest threat to mankind. Mosquito-borne diseases infect about 700 million people each year and kill 3 million according to the US Centers for Disease Control. On average, one person dies every ten seconds as a result of "a little mosquito bite".